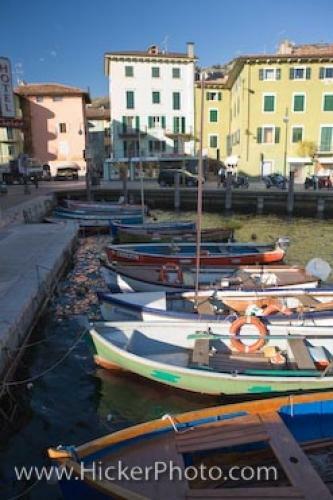 The Lake Garda waterfront in the town of Torbole in the Province of Trento, Italy is adorned with small boats of various colors. Along the harbour waterfront of Lake Garda in the town of Torbole in the Province of Trento, Italy, a selection of boats are anchored. Bordering the waterfront, motorbikes and cars are parked where people take to the water in one of the boats or roam the streets of the resort town of Torbole.Torbole is nestled at the base of Monte Baldo which makes the landscape great for hiking, mountain climbing or biking.Lake Garda is the largest lake in Italy where many resort towns are found along the shores as wind surfing and sailing are incredible.Small Boats in a harbour along the Lake Garda waterfront in the town of Torbole, Province of Trento, Region of Trentino-Alto Adige, Italy, Europe. Lake Garda waterfront in Torbole, Italy.